My Cherry Pie, Cool Drink of water what a sweet surprise, tastes so good makes a grown man cry, sweet cherry Pie, Oh ya!! Ok, I’m a geek! But come on whenever I think of cherries, I think of cherry pie, than I think of the 80’s song “Cherry Pie” by Warrant. Now that song is stuck in my head and I bet it ‘s in yours too!! Saturday, I decided to make some Cherry Quick Jam. It’s one of those things I keep meaning to make, but I am either to lazy or I just haven’t gotten around to it. I’ll tell you more about it in a bit. First I wanted to tell you I went to the Farmers Market and bought some more goodies. I really do enjoy going there on Saturday mornings. Today is was quite hot, but windy, so it wasn’t to horrible to walk around in. Here are a few things I got! I kind of have a thing for fruit, if you can’t tell. I spent $25.00 on all this. I bought the plums for my Husband. Our neighbor has a plum tree in her yard and my Husband has been waiting patiently for them to ripen. There still green, but I would imagine they’ll be ready in a few weeks. Until then, I bought him some plums. I also bought half a case of strawberries. I swear I am going to turn into a strawberry if I keep eating them like I have. I just love them! This is my favorite time of the year because of all the fresh fruit!! After the Farmers Market I did my weekly grocery shopping at Trader Joe’s. 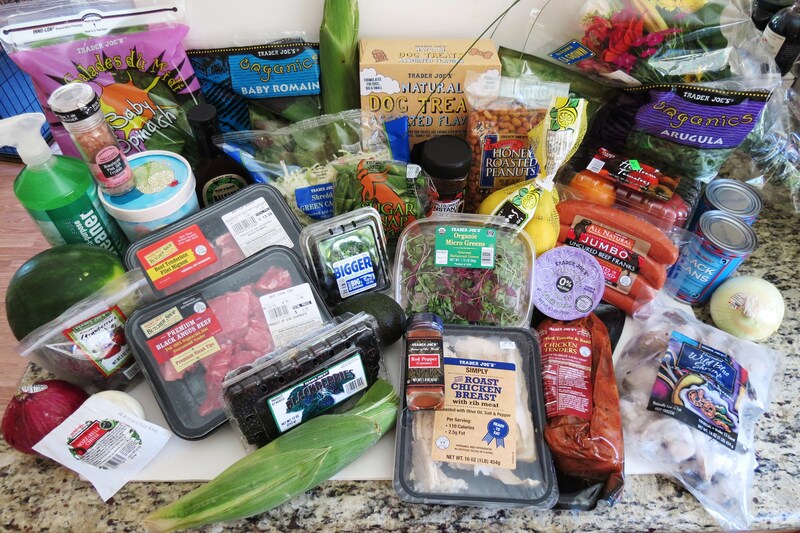 I found a few new finds, which you’ll find on my Trader Joe’s page. You have to forgive the text on the page, it keeps changing on me and it’s making me crazy, I just don’t know how to fix it! I met a new worker at TJ’s and he was just the nicest guy. He was serving the samples today and he is one person that got excited about food. He was walking me around telling me to buy this and use it on that, ect… Thats one reason why I love TJ’s. I tend to socialize there alot, not only with the workers but the customers to. I was talking to one lady about pasta dishes, and she gave me a great idea for a dish, so stay tuned! I didn’t do to bad at TJ’s. I spent $136.00 and got quite a bit of meat, including Filet Mignon. I guess you have an idea what I’ll be cooking this week!! After TJ’s I decided to come home, make a nice lunch and got some rest. For some reason I am just so tired today that I actually had a cup of coffee in the afternoon. I really need to clear out the freezer so I can make room for ice. When it’s hot out, I want ice coffee, not hot coffee, but I settled for hot today. I have to say, since I cut WAY back on coffee, to one cup a day, I have saved so much money on milk and syrup. I feel better about myself and my pocket book thanks me! Than I decided to make my Cherry Quick Jam. 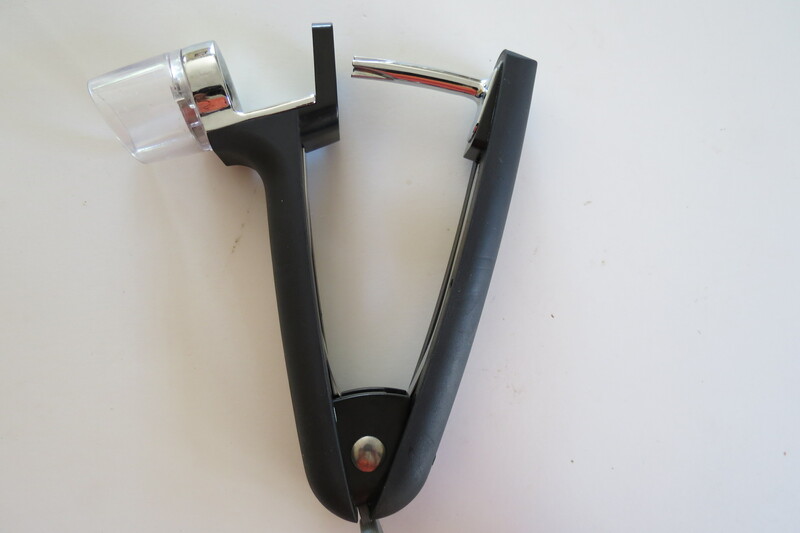 One thing I will tell you, if you work with cherries, you really, really need to get a cherry pitter. I bought mine at Cost Plus, but I know Target has it to. You can also use these to pit olives. You save yourself a big cherry mess with the pitter! No splatters anywhere and your clothes stay clean!! However, my fingers turned red. 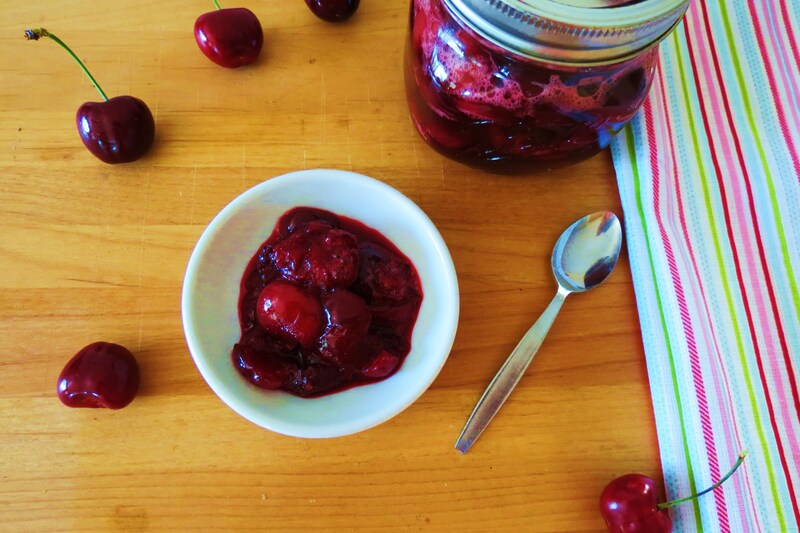 Cherry Quick Jam is really easy to make. 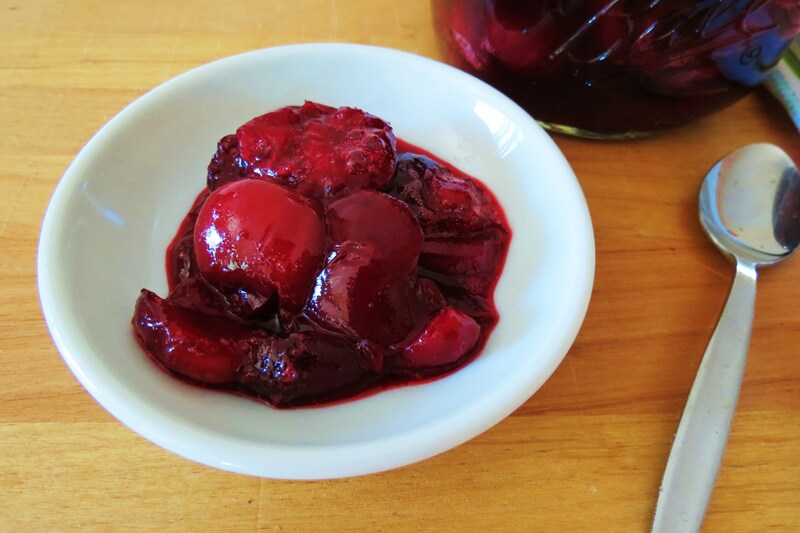 Once you pit the cherries, cut them in half, the whole process takes about 10 minutes. Now this is a quick jam, so you can’t can it! 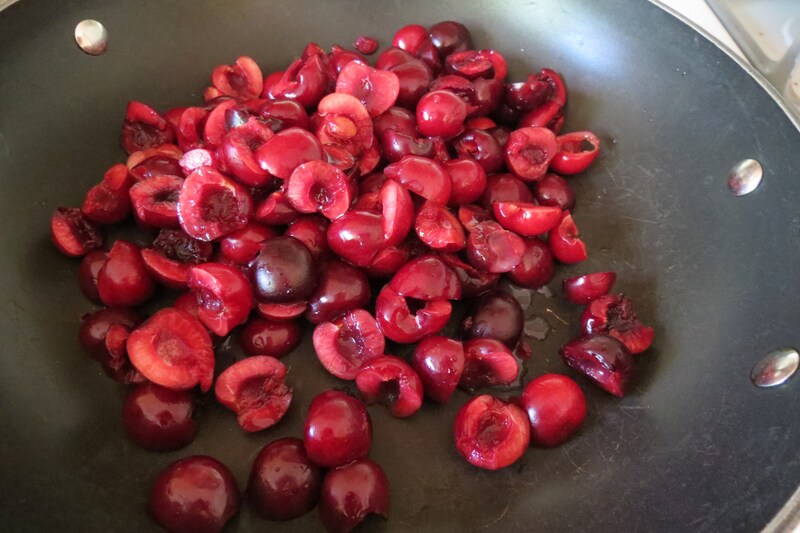 Here are the cherries in my skillet getting ready to be heated up and turned into yummy jam!! Turn the heat up to medium high and cook until it gets thick and bubbly, about 10 minutes. Here it is half way through cooking time. Once it’s all done place in a mason jar, top with the lid and leave on the counter until cooled. Than place in the refrigerator. The jam will thicken up as it cools. The pictures I have, are shortly after I made it so it was still warm, but I wanted you to get an idea. The jam is fantastic! I only added 1/2 tsp. of Stevia to it. If you like it to be sweeter, I would add about 1/4 cup of sugar. My Husband said I needed to add more sugar, that it was a little tart for him. For me, I like the natural sweetness of the fruit, and I’ll be the one eating it so I’d prefer no sugar. I’ll let you judge on how much sugar you want to add. To describe this jam, I would say it tastes like cherry pie filling. It’s sweet, a little tart and just wonderful! I really love it! You can make quick jams with just about any fruit. I plan on trying it with all fruit. As you know I have made Strawberry Quick Jam and a Berry Compote, which is the same concept of the Cherry Quick Jam. You can also use frozen fruit, however the cooking time will be a tad longer, maybe just by a few minutes. So spend a half hour of your Sunday making some quick jam, you won’t be disappointed and you will be so proud of yourself. Not only will you be getting a healthy jam that you can use on toast, sandwiches, pancakes, yogurt, ice cream, oatmeal and more, but you’ll be saving a ton of calories! 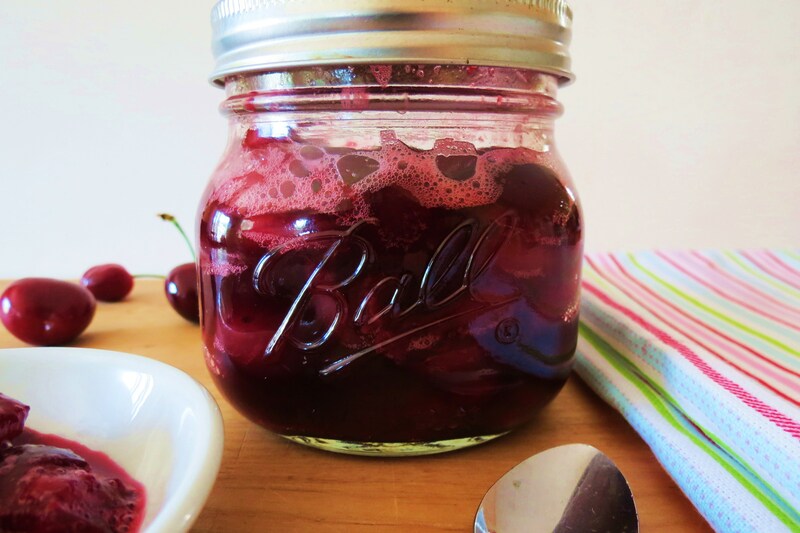 The Cherry Quick Jam is only 23 calories per 2 tablespoons and no added sugar! All natural! Now be sure to make this, I have some recipes I plan on making this week, and I will be using my quick jam. 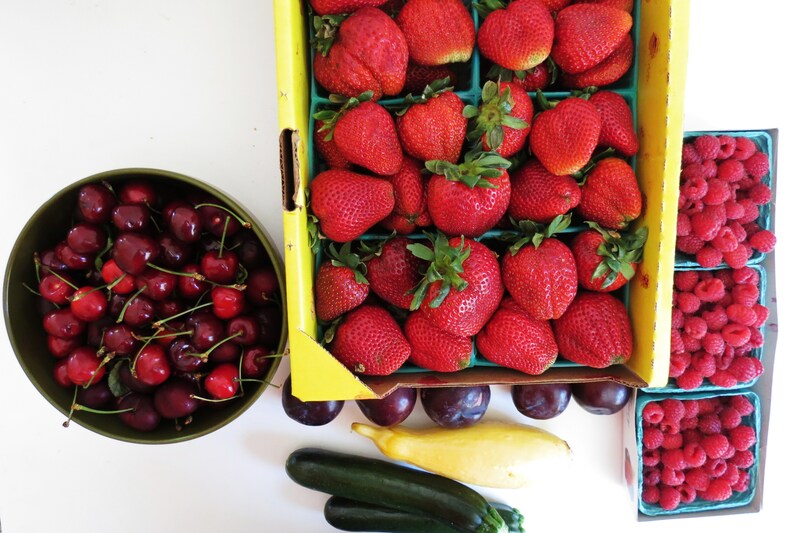 If you’re not a fan of cherries, try it with another fruit, like strawberries, raspberries or blueberries! 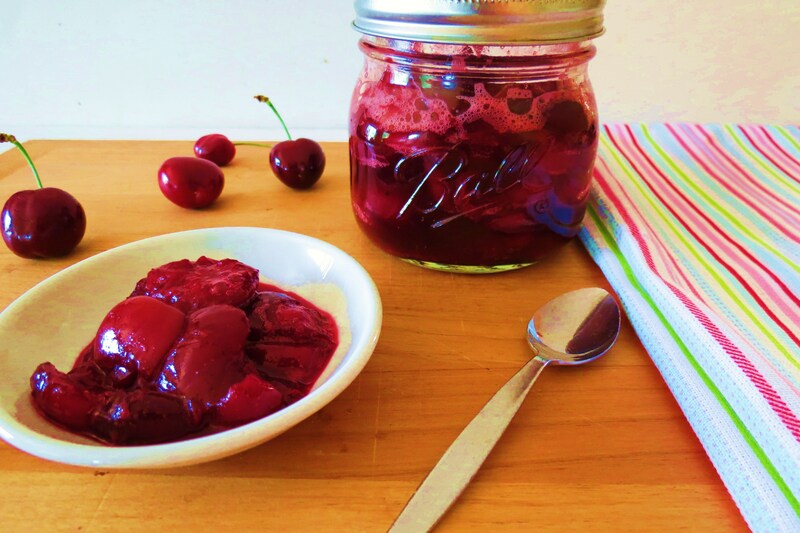 A sweet cherry jam, that tastes like pie filling. It's healthy, quick to make, low calorie and completely guilt-free. Wonderful on ice cream, yogurt, oatmeal, pancakes, toast and so much more. 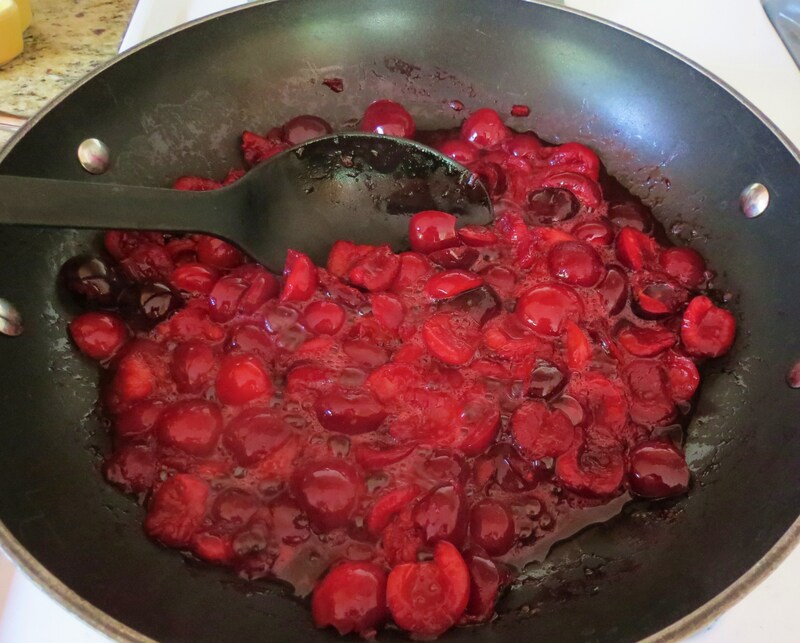 Cut cherries in half and place in a large skillet and add lemon juice and Stevia or Sugar. Cook on medium high heat, stirring constantly. 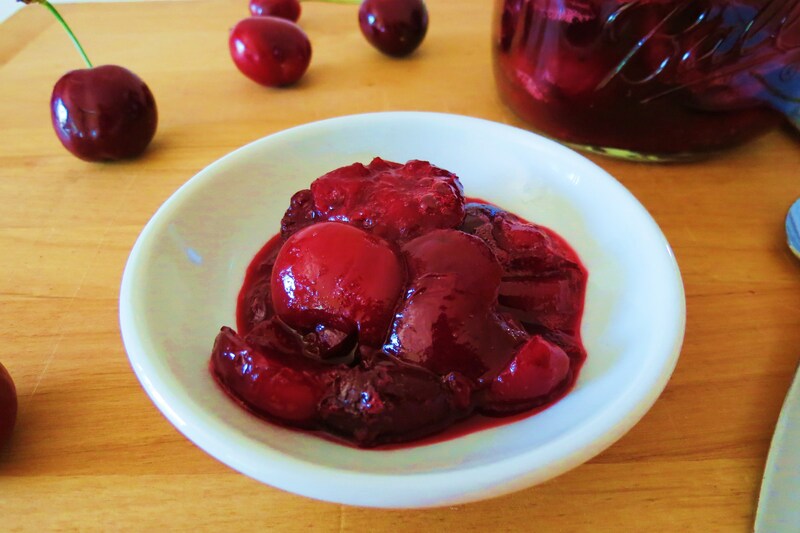 As the cherries heat up, mash them with your spoon, it's ok to have big chunks of cherries. Cook until thick, about 10 minutes. 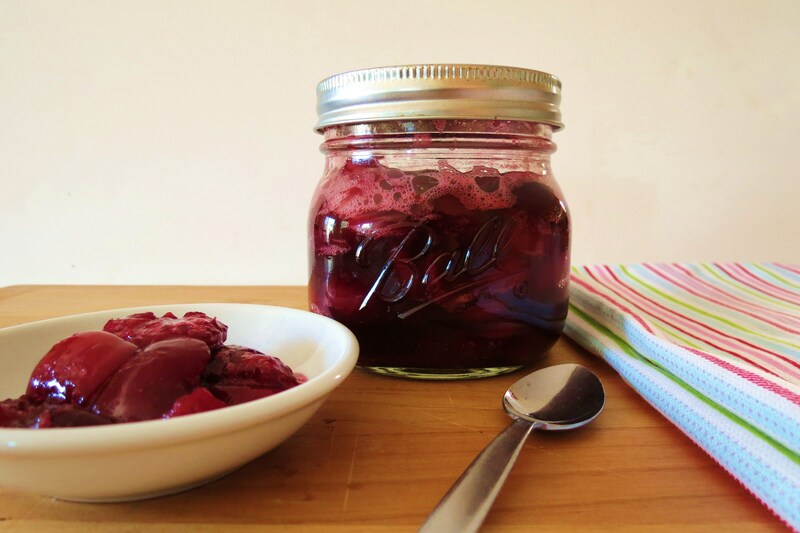 Place jam in a mason jar. Let it sit on the counter until cooled, than place in the refrigerator. Do not can this jam. If you like a sweeter jam, just add more sugar, such as a ¼ cup. Oh my Gosh! I am singing the Cherry Pie song out loud and my dog is wagging his tail. Darn that song! I need to turn on some other music so I can get this song out of my head! Well my Peeps, I am signing off, time to make dinner. Don’t forget to check out my Trader Joe’s page, it’s all updated with the latest and greatest. Also, make some jam, I have a new recipe I want to try and I think you’ll like it and using fresh homemade jam in it will taste phenomenal! QUESTION: What is your favorite kind of jam or jelly? I’ve actually never made jam before, so I’m going to try your strawberry jam. It looks simple enough and we have quite a few strawberries on hand. And I LOVE your updated TJ’s list. You’ll love the strawberry jam! Thats my next one to make again! When you make it, use a few not completely ripen strawberries. The little bit of green on the strawberries creates pectin and preserves the strawberries longer. Let me know how it turns out! I think you will be pleased with it! It is cherry season here now and with cherries so cheap I buy them by the bag full! I have been thinking to use some to make a cherry jam so this is just perfect. Cant wait to try it out! 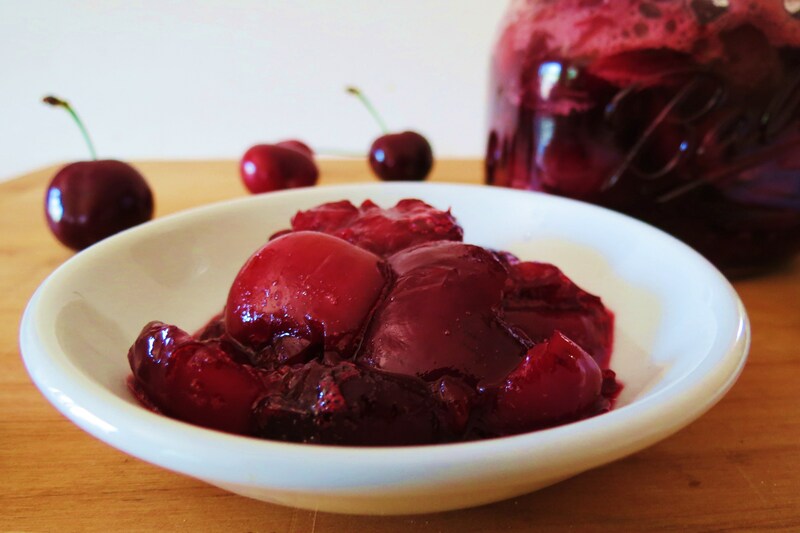 I try to preserve the cherries this time of year by freezing a batch of it! I just love cherries! I’m glad to see the costs are going down on them If you make the jam let me know what you think of it. Absolutely LOVE homemade jams, especially when they aren’t loaded with sugar. Like you, I love the taste the true flavor of the fruit and I think the sweetness they provide is (almost) enough 🙂 Perfect! How long do you think this will stay good for in the fridge? When I make quick jams I normally use it up pretty quick, they tend to go on everything. The longest it lasted in my house was about a week. However, I am pretty sure it will last up to two or three weeks in the fridge. Your probably not as crazy about cherries as I am! Wait till you see tomorrows recipe. Homemade jams are the best during berry season! I couldn’t agree more!! I eat so many berries, it’s crazy! That sounds really good! If I get cherries I’ll have to try that! Oh you’ll love it!! Get cherries before they go out of season! This is great! I actually spent about 20 minutes looking at different jams and couldn’t bring myself to buy any b/c of the added sugar. I’ve made Chia Jam with berries before, but love the simplicity of yours; I’ll be making this soon. How do you think a non-berry fruit would do? I’ve never had it, but a banana jam would be awesome for PB&J!! Thanks, I’m subscribed to your blog now!! Hmmm, interesting, banana jam, honestly I don’t think it would last long because banana’s go bad pretty quick. I know oranges, lemons, limes,plums and apples would be good as a jam. Still thinking banana, I just don’t think that would would work. Chia Jam is a great idea. That would thicken it up without pectin. I’m going to try that with strawberries! Can you freeze it? I LOVE cherries, but I’m the only one in our house. I made loads of freezer jam with strawberries every year – think I need to add this one too! Hi Wendy, I’m the only one in my house that eats it to. I am sure you can freeze it. I would follow the directions as you do for strawberry freezer jam. Personally I have never froze jam, but it’s a great idea too!! I think I will try it out this weekend! I’ve only frozen strawberry jam so far, but I will try this as well. Last year we got through January with fresh tasting all strawberry freezer jam. This year I’ll double what I put up. I love that you don’t add much sugar – I mean, it’s fruit already! I haven’t been adding the lemon juice, but I’m gonna try it your way this weekend – it sounds delicious! Thanks!! I freeze cherries, so I’m pretty positive they will work out. I add the lemon juice to preserve the fruit a little and prevent it from coloring. Kind of the same concept to put lemon juice over apples. When you try it let me know. I think forsure I am going to do it this weekend too! I love the idea of having strawberries and cherries for the winter. Now to clear out the freezer to make some room! Delicious! I just made this tonight and can’t wait for breakfast! It tastes wonderful warm. And ZERO Weight Watcher points! How awesome is that?! Thanks so much. I’m new to your site, but I’ll not be a stranger! !